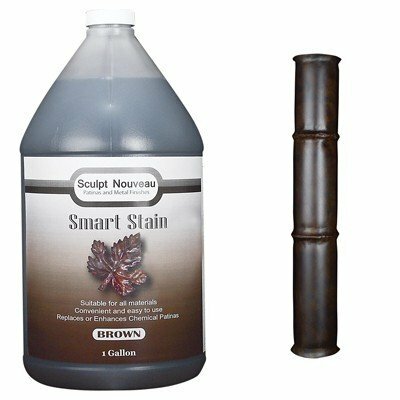 Smart Stains are a strong, non-hazardous, fast drying, transparent patina system. They have no VOC and no odor. 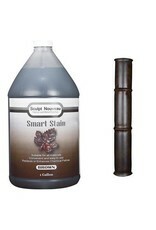 Smart Stains work on any metal or substrate as well as over patinas and other oxides. They are available in most colors as well as brass, copper, and silver. Smart Stains are made by combining finely ground, naturally occurring colored oxides with a water base polymer/resin binder. They are sold concentrated and may be diluted with distilled water up to 25% to increase transparency. Only Smart Coat 1K should be used to dilute any further. For exterior applications, Smart Stains can be sealed with three layers of Smart Coat 1K (with a one hour drying time between each layer). Smart Stains contain UV inhibitors and will not fade outdoors if maintained properly. Maintenance requirements will vary by location. In most environments, regular application of a wax or oil is sufficient to maintain this finish.